Harrisburg, PA – Today, Governor Tom Wolf visited New Directions Treatment Services in Bethlehem. 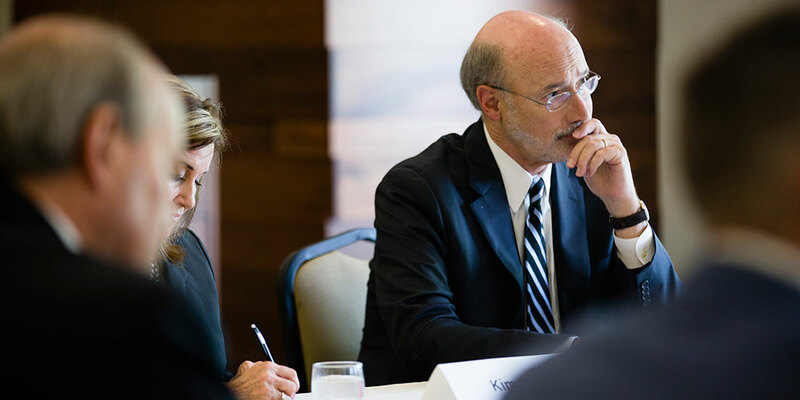 At New Directions, which has been selected as a center of excellence, Governor Wolf hosted a roundtable to discuss his administration’s efforts to battle the opioid epidemic and how the state can continue this fight. The 2016-2017 budget included $20.4 million for Centers of Excellence which serve as central, efficient hubs around which treatment revolves. These centers will have navigators to assist people with opioid-related substance use disorders through the medical system, and ensure they receive behavioral and physical health care, as well as any evidence-based medication-assisted treatment needed. “I was very pleased to welcome Governor Wolf to our clinic today,” said Mairead Desmond, ‎Executive Director at New Directions Treatment Services. “The Governor’s commitment to helping people in the Commonwealth, as evidenced by his much needed expansion of Medicaid, is appreciated by the people we serve in our programs. Without that expansion, many of them would have been unable to get the care they need. “At the AATOD conference late last year, Chuck Rosenberg of the DEA, in speaking about Medication Assisted Treatment for OUD, said that we cannot ‘enforce or prosecute’ our way out of the opioid epidemic that is having devastating consequences in our country. Mr. Rosenberg said that the way to address this crisis is through demand reduction and demand reduction can be achieved by making treatment available to everyone who needs it. Governor Wolf has been helping to make that happen in Pennsylvania.